The growing global population demands more food in more places. To meet the demand, the food industry must deliver more and longer-lasting food supplies. Also, increased consumer dependency on digital services or dietary choices is having an impact on how food (service) providers need to deliver safe and quality food. The food we eat, whether it’s fresh, prepared or even preserved, is seldom sterile and may be contaminated with spoilage micro-organisms or occasionally with pathogens. 1 out of 10 people fall ill every year from eating contaminated food. Food safety is critical to public health and to the reputations of businesses that manufacture, sell or serve foods and beverage. A single contaminated food source from a food-processing plant or a restaurant may affect a large number of people. That’s why the food industry and the government set standards for food safety (including HACCP and GMP) and monitor food sources to control and prevent foodborne disease. Micro-organisms, including pathogens, colonize and grow on common foods. Foods provide a suitable medium for the growth of various microorganisms, and microbial growth often reduces the food quality and availability. Examples are Campylobacter, Clostridium, E.coli, Listeria and Salmonella. Consumers have a right to expect that the food they purchase and consume will be safe and of high quality. Cleaning and disinfection goes a long way in achieving these objectives, no matter what food or beverage industry. Hygiene has to play an essential role in the processing, preparation and consumption of food. 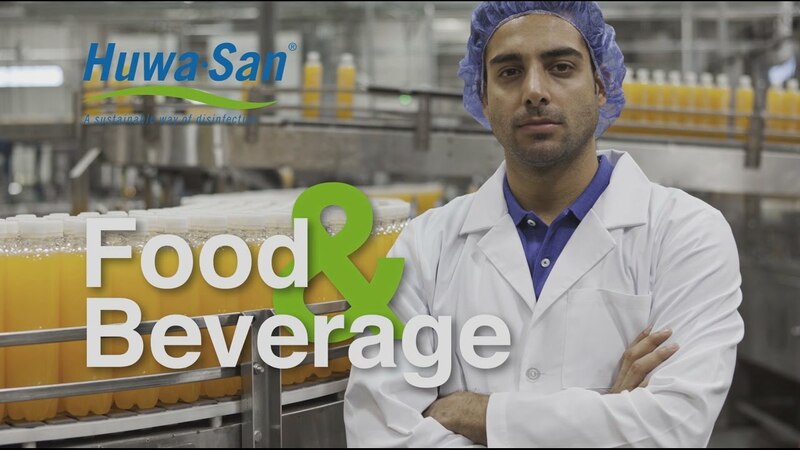 Watch our Food & Beverage video! Check out our Huwa-San Food & Beverage video!